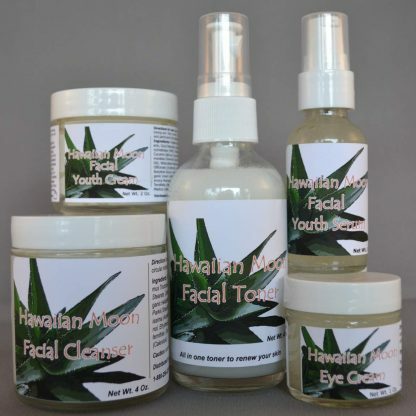 Hawaiian Moon Five Step Rejuvenation Package - Fresher, Younger Skin! All five of our Hawaiian Moon Facial products to rejuvenate your skin. Save 50% on our rejuvenation package! To turn back the clock and get fresher, younger skin, use all five products together as part of your daily regimen! 5 steps to rejuvenate your skin! 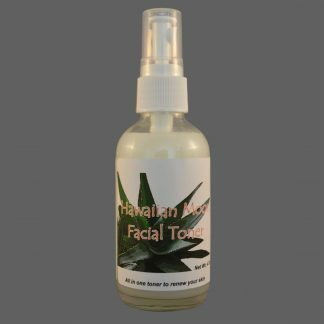 Our facial cleanser gently, but effectively, cleanses your skin of dirt, oil, and make-up. This cleanser will leave your skin feeling soft and supple, with a new firmness to it. Our toner balances the skin’s pH levels and prepares the skin for moisturizer. This toner will leave your skin nourished, balanced, and toned. With the use of our toner, absorption of serum and cream are dramatically enhanced. Our serum is an ultra-intensive formula that deeply penetrates anti-aging nutrients into the layers of your skin. Hyaluronic Acid makes up fifty percent of this high quality formulation. 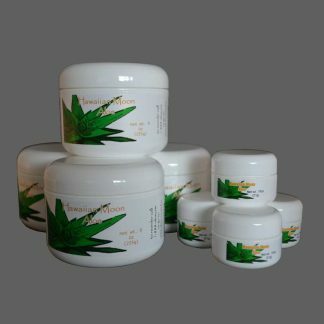 It activates collagen production for a firmer, fresher, younger, and brighter complexion. Our eye cream is specially formulated for the delicate eye area. It fades sun spots and discolorations, refines skin texture and reduces wrinkle formation as well as minimizes existing wrinkles. A gentle and effective treatment for delicate eye area to revitalize and turn back the clock. 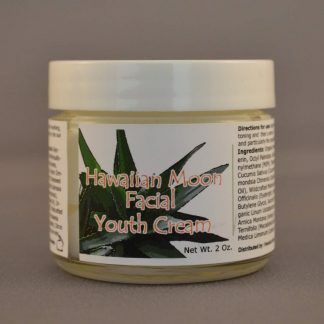 Our youth cream both moisturizes your skin and has amazing anti-aging ingredients. Use it to restore firmness, heal sun damage, increase hydration, erase wrinkles, smooth texture, nourish at the dermal layer, minimize irritation, increase skin brightness and even out skin tone. Please see each individual product’s item page to find the instructions on how to apply each product. My mom got me this set for my birthday last year. She actually started using it the Christmas before because it was on sale or something like that. Anyway I started noticing how her skin looked different. Like it glowed or was softer or something, just different in a good way and she said she was using some new skin products. Fast forward and I’m now using them too (I think my favorite is the Cleanser!). They feel super high quality and they work really, really nice together. I just purchased another set last week and it even had a coupon so I saved more money! Restore firmness, heal sun damage, increase hydration, erase wrinkles, smooth texture, nourish at the dermal layer, minimize irritation, increase skin brightness and even out skin tone.